The Roman reputation for extravagant displays was hard-earned, with thousands of people involved in staging various entertainments. There were the ever-popular gladiators, battling it out in arenas across the Empire for audiences enthralled by the prospect of death and blood. Other entertainments involved the hunting of dangerous and exotic animals. But the most spectacular, and expensive shows, were the naumachiae. The naumachiae were reconstructions of sea-battles which involved a cast of thousands, usually people drafted from the prison. Engineering works had to be carried out to flood arenas — either using water from local rivers or by building vast artificial lakes. 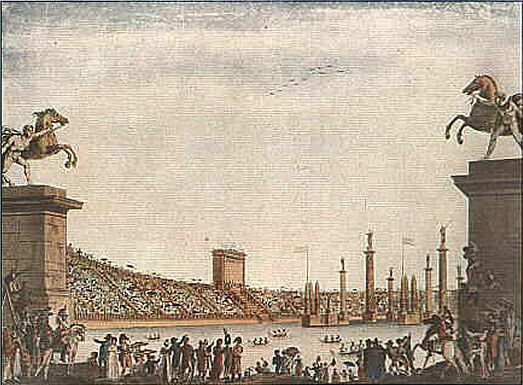 A modern naumachia held in the Civic Arena of Milan in 1807. The first recorded naumachia was staged in 46BC to celebrate the crushing of Pompey the Great by Julius Caesar. The show was not a great free-for-all battle, but instead a carefully staged re-enactment of a historic engagement between the rival fleets of Tyre and Egypt. The two sides wore uniforms, but this did not mean that the event was in any way sanitized. These were real battles, even though the winner was already determined. As with the gladiatorial fights there was death, mutilation, blood-letting and, as an added bonus, death by drowning. Not all of those involved in the fighting were prisoners of war or convicts who hoped to avoid a death sentence by receiving a pardon through participating. 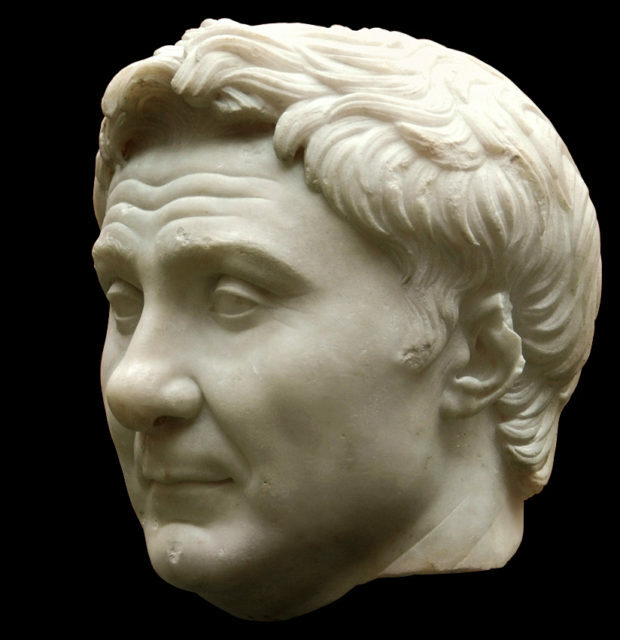 There is a record of a Praetor, a government official, taking part in Julius Caesar’s naumachia. An artificial lake was dug expressly for the purpose of this particular show and was filled in again afterward. The propaganda purposes of these events cannot be overstated. The size of the spectacle, the number of tradesmen, engineers and associated businesses involved, let alone the thousands of combatants, all added up to a massive display of economic and military power. A few years later, the son of Pompey the Great held a naumachia at sea in the Straits of Messina, between Italy and Sicily, to celebrate his victory over Octavian. There were serious difficulties staging such an event. For example, the organizers had no control over the sea currents, something that wouldn’t be a problem in an arena. But the purpose of this show was pure propaganda, staged as it was in full view of his defeated foe. 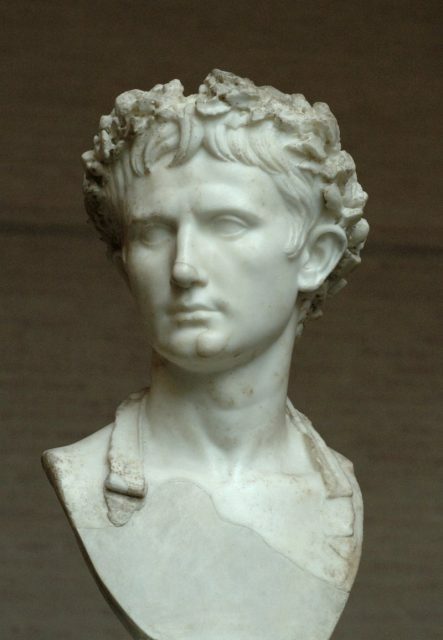 In 2BC, Emperor Augustus built another artificial lake on the banks of the Tiber. This one was more permanent and was used for a number of events, the first being a naumachia to honor the dedication of a new temple. 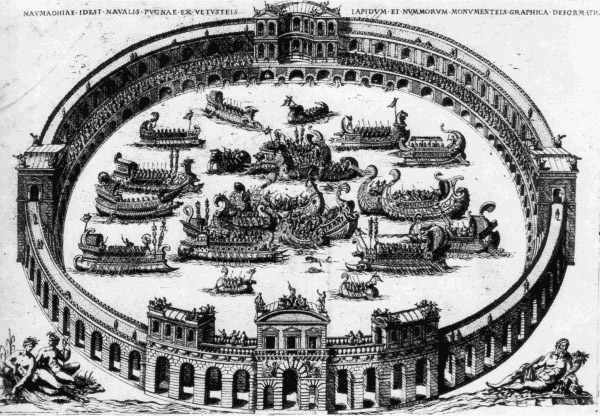 The lake was 1,200 by 1,800 Roman feet, almost as long as the Circus Maximus and two-and-a-half times as wide. It could accommodate more than 30 ships. In the middle was an island accessed via a bridge hewn, in part, from a single plank. It was in 57AD, during the reign of Nero, that Roman engineering reached a peak. In the Campus, Martius Nero had an amphitheater constructed of stone and wood in which a naumachia was held in the afternoon and a gladiatorial battle later on in the same day. 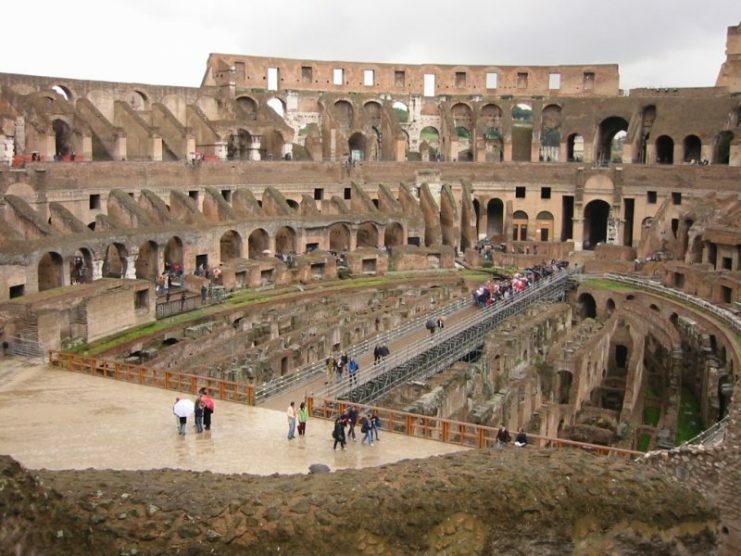 Unfortunately, this structure was lost during the great fire of Rome. 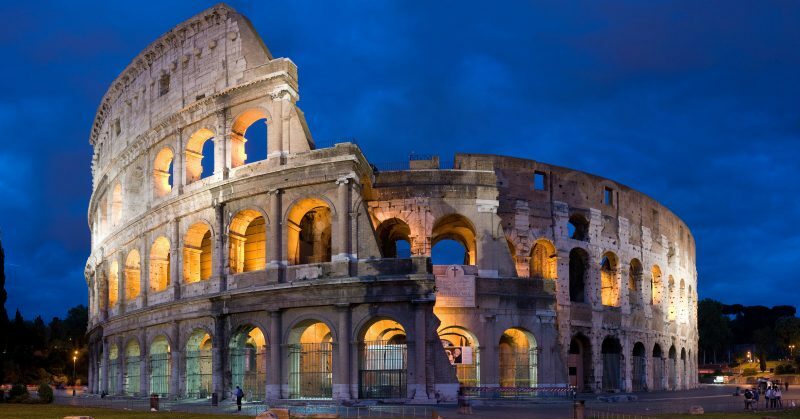 A few decades later, in 80AD, the same engineering expertise was employed in celebrations to dedicate the Colosseum. Naumachiae were possible at the time because the underground storage rooms and access tunnels were yet to be built. As part of the dedication event, Emperor Titus staged another naumachia on the artificial lake built by Augustus. Planks were laid across part of the lake and the celebrations began with gladiatorial games and animal hunts. The following day there was a horse race and the day after 3,000 men were joined in a naval battle. The last recorded naumachia of the Roman period was in 248AD when Emperor Marcus Julius Philippus commemorated the thousandth year of the founding of the city of Rome.